When people decry the high cost of government, some point fingers at the huge federal bureaucracy; others fret over wasteful management practices in Sacramento. In fact, these critics are looking in the wrong places. By far, the most pervasive waste is found in the management of local governments, not because of corruption (although we see a bit of that from time to time), but because of unnecessary and costly duplication of countless areas of service. California's 58 counties house nearly 500 cities and about 1,000 school districts. Most of the cities and school districts were created years ago when they were miles from each other and transportation occurred via horse, not automobile. But times have changed. Cities have filled in and now one typically begins where another ends. Moreover, travel between nearby places takes place in minutes, not days. All this suggests the time is long overdue to consider the costs of these independent bastions of government. With 9.8 million residents, Los Angeles County is the most flagrant, though hardly only example of unnecessary duplication. Forty-five police departments operate in 88 cities, with most of the rest opting for protection from the Los Angeles County Sheriff's Department. The same goes for fire protection, where 26 cities in Los Angeles County have their fire departments. Most of the rest rely on the county for service. But the most egregious duplication is found with public education; no fewer than 79 school districts provide public education in this single county. Some overlapping jurisdictions truly defy any semblance of logic. With 85,000 residents, Whittier has four school districts. Think of all the administrative overlap at a time when schools are overcrowded because of massive teacher layoffs because of revenue shortfalls. Taxpayers, parents, and children are paying a massive price for their "local" school districts. This pattern is repeated throughout the state. Orange County, a relatively compact 789 square mile patch of land, has 19 police departments, 12 fire departments, and 28 school districts. Alameda County, nearly the same size, 14 police departments, 11 fire departments, and 18 school districts. Think of all the bureaucratic overlap with all of the expensive chiefs, superintendents and their many deputies that could be avoided through consolidation. Of course, such reconfigurations could occur only if residents are willing to trade autonomy for reduced costs. And most are not. Mergers and consolidation are not for everyone. Sometimes geographical distances between communities are too great or community services in adjacent cities are provided under radically different conditions. 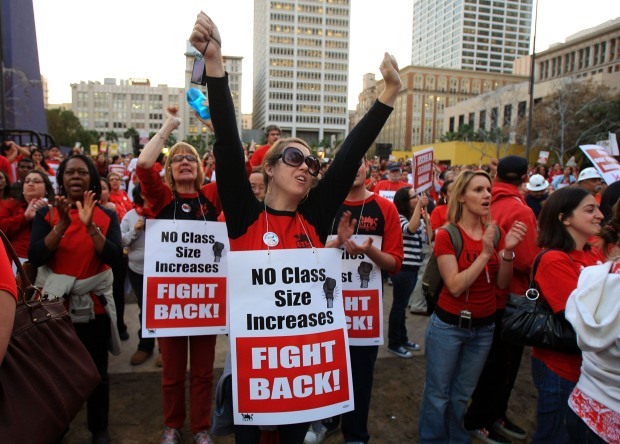 Also there are push backs from protectors of the status quo, ranging from well paid administrators to organized labor. But the opportunities are there, and similar mergers have successfully occurred throughout the nation. A few have even taken place in California, although they represent just the tip of the bureaucratic iceberg. It's time to consider mergers of public safety departments and school systems throughout the state. If we want to save money and provide better services, there's no better place to start.